Equestrianism is an age-old sport that is played all over the world. It is not precisely one sport but basically an umbrella term for multiple horse-related activities like horse driving, riding, vaulting, jumping, and steeplechasing. It also includes practical uses of horses such as transportation, recreation, cultural exercises and the likes. Nonetheless, amongst all of them, horse riding is the most common and popular. Firstly, it is essential to know that horse riding is indeed a sport and there are no arguments there. In fact, it is labeled as one of the oldest sports in the world. People who ride horses make it seem so effortless which leave everyone wondering whether riders just sit and the horses do everything. However, that is far from reality since horse riding takes hours, weeks, or months of rigorous practice that often ends up with the rider suffering from sore muscles, chafing and bruising. What makes it more difficult is that there are multiple styles of horse riding. Although there are different styles of horse riding, no matter what your age is and how much prior experience you have with horses, you will surely enjoy each one of them. Within the Western horse riding category, there are sub-disciplines such as Western reining, pleasure, cutting and so on. To have a vague idea of Western horse riding, picture the American countryside. Here, English does not equate with British, but it originated from Britain. One feature that distinguishes English horse riding from the rest is the saddle which has no horn. This is considered to be the topmost discipline of horse riding, but it is definitely not meant for the faint-hearted. The riders practice for years for this sport as it involves them to be physically and mentally fit. Riding a horse might be fun but safety must also be considered as the horse’s behavior is unpredictable and obstacles on the pathway or route may also cause trouble. Hence, you must always have the appropriate safety gear. This is the most obvious gear that is essential for horseback riding. 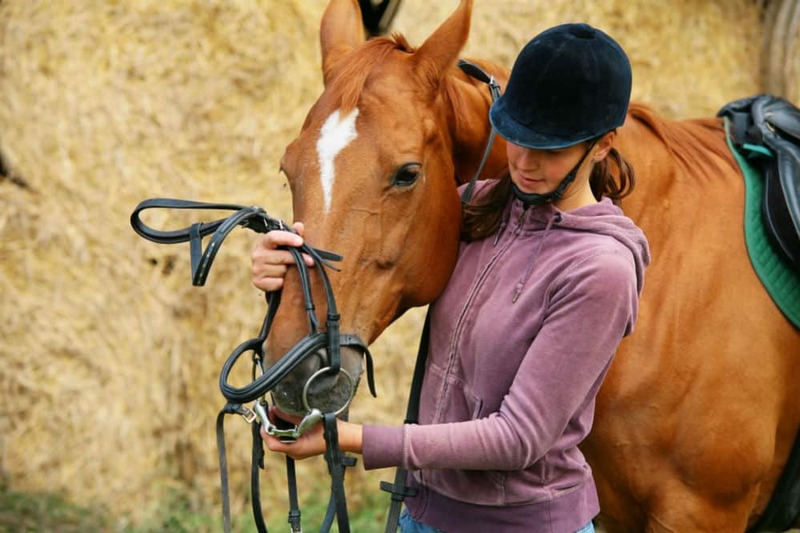 When choosing one, make sure that you buy a product that is meant for horseback riding and has all the appropriate certifications making it extremely safe for use. The top wear depends on what the specific discipline of horse riding you are going to participate. For example, if it is a Western-style horse riding, you would likely have to wear Western bling show shirts, and if it is something classic like English style, then a coat will be the best option. Boots that are designed for horse riding have features for great comfort and fit. There are several kinds such as Western cowboy boots, paddocks (short boots), and field (tall boots). Again, the type that you should choose depends on what style of horse riding you will practice. Riding helmet covers are essential especially if you are horse riding in cold climates as their primary aim is to keep your head warm. These are an absolute must and choosing one should be done as carefully as possible since an uncomfortable one will make your riding experience unpleasant. So, if you are looking for one, we have reviewed the Helmet Covers Etc. Fleece Equestrian Riding Helmet Cover for you. The Fleece Equestrian Riding Helmet Cover by Helmet Covers Etc. One of the biggest reasons why you need this equestrian helmet cover is that it is made out of a 100% polyester material, which means that not only will it keep you warm but will also be very comfortable to wear. It is also designed in such a manner that it will completely wrap the helmet. Likewise, it contours the helmet shape without being saggy in any corner. In addition, it also comes with a Velcro closure which ensures that you have a very snug fit all over the helmet, especially in the neck area. This Texas-made helmet cover comes in a plethora of 13 colors including black, bright pink, red, yellow, blue, gray, and brown. Similarly, it has three different sizes—one for kids, another for youth, teenagers or petite adults, and the other for adults. On another note, this cover can be washed in the machine as well as machine dried at a low heat setting. The colors are brighter than they appear. The Helmet Covers Etc. Fleece Equestrian Riding Helmet Cover is a perfect horse riding gear that will help you ride comfortably even on those extra chilly days. It comes in 13 different color choices and three different sizes to fit everyone’s needs. Additionally, it is made in the USA and the material used is 100% polyester, which is washable. We compared the Helmet Covers Etc. Fleece Equestrian Riding Helmet Cover with the Equestrian Helmets Winter Riding Helmet Cover as it can also fit everyone but only has one size that is marketed to suit everyone. It also comes in different colors, but as compared to the one from Helmet Covers Etc., there are only four options. Additionally, this cover is made out of lycra which gives a snug fit but does not keep you warm like the 100% polyester cover which is also machine washable. Horse riding is an activity that is worthy to try since there are different styles to learn that you and your partners, kids, friends, and relatives will surely enjoy. You just have to take note that you should also wear the proper attire for comfort, safety, and style. When it comes to helmet covers, we can say that the Helmet Covers Etc. Fleece Equestrian Riding Helmet Cover is a superior product. That is because this cover is guaranteed to keep you warm and comfortable on those cold winter days. Its accurate sizes and variety of colors are also a plus that you should not take for granted. Informative post and great review!